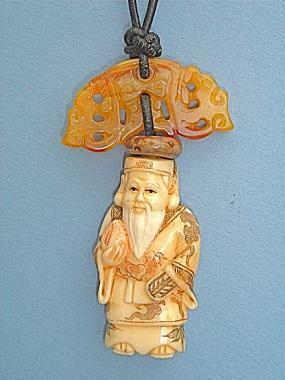 Jade Fu Dog and Flourite Melon Cord Necklace. Approx 2 1/2" drop x 1", on an adjustable leather cord. 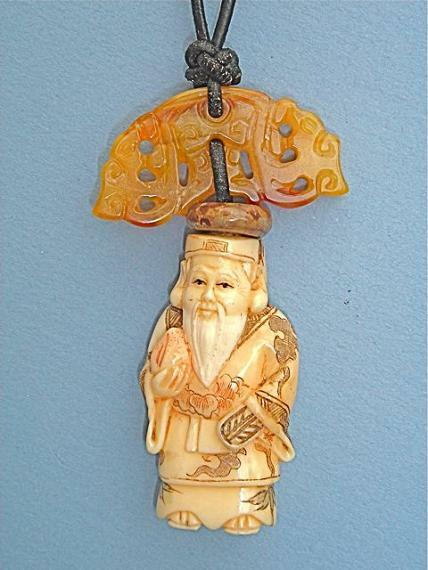 The God of longevity happiness and wealth, Fukurokuju or Shou-xing, often shown holding a peach and accompanied by the White Deer, symbolic of long life. Legend has it that Shou-xing lives in a palace at the South Pole surrounded by a garden of aromatic herbs.